I'm working on the math today, but before I get too far, I wanted to post this screen capture. Thinker Thunker's tree is not 18 inches across, according to his own measurement. In this one image alone it varies from 16 to 17 inches. He has 2" of measuring tape hanging out on the left side. This can mess up all of the math, BUT since his math roughly added up to his own known height, the section of tree he used may have really been 18 inches. I'd look closer but it's not too relevant now. TT also assumes she's within 5-10 feet of that 12" tree, but JG's diagram says the trees are 60 feet apart. She could be 30 feet or more from that tree. If I read the JG sketch correctly, TC 1 is 105', TC 2 is 115' and the 12" tree is 167'. I think this puts both front trees at about 8 inches across (but a lot of potential for error). 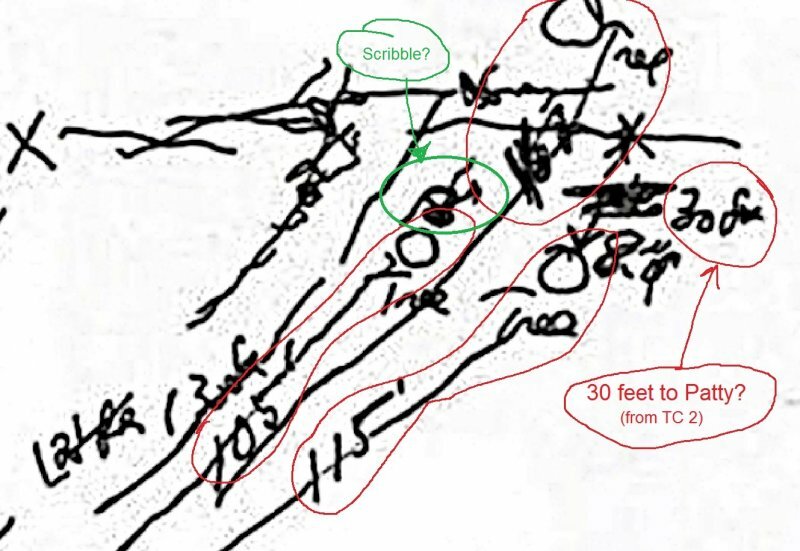 I think the left tree was really 8 on JG's diagram and the rest of that is some other scribble. Patty 'might' be 121 feet in the very frame we're looking at if the look back frame was what JG was diagramming here. ALL of this should be enough to get a decent height number, if I can only determine where her feet are. I'm working on it. According to Green the center tree is the closest to the camera. It is not. Clearly Patty walks behind TC1 and TC2 and in front of the 12” tree. But he has the 18” tree the furthest from the camera. According to this triangle....the middle tree is about 50' further back in the scene than trees TC-1 and TC-2. Good call on 167, I thought that was a 16 and a arrow. So the film subject must be 136 ft? I drew circles - That's the bigfooting thing to do. The math I was trying to do puts her at about 5 feet tall. I'm all out of whack now. Good job of deciphering "30 ft", Redbone....I had no idea what that was supposed to say. I think John Green was a doctor writing prescriptions in his former life. Reading the Munn's document, he say's that is 162 instead of 167. It really could be. I calculated 172 feet to the far tree using an autocad simulation (which is only good if the front trees are EXACTLY 8 inches across, the rear tree is EXACTLY 12 inches across, and the 105 Feet measurement is exact to center of tree. Whatever the reality is, I can't make accurate height calculations from any of these trees. I'll keep reading the Munn's doc and maybe it will help me discover my error. I am interested in seeing what you can work out. ^ am interested in seeing what you can work out. 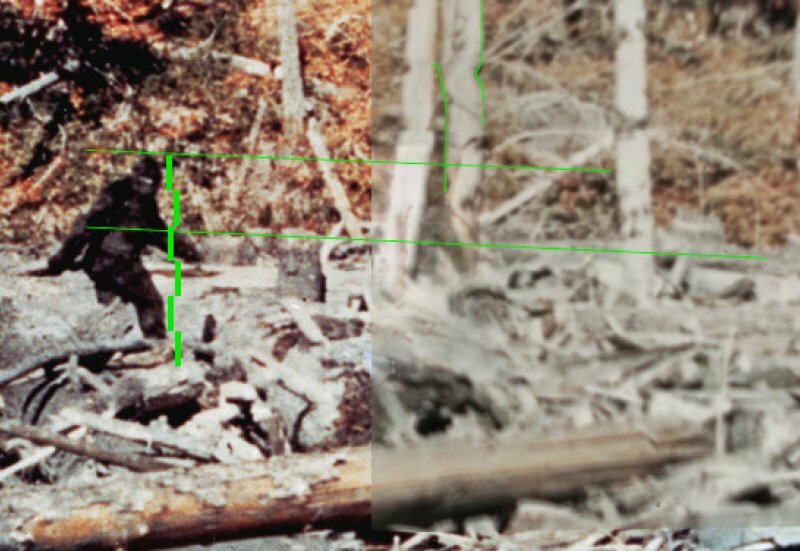 This attached image puts her at 6 Feet tall IF the back tree is 12 inches and she's the same distance away from the camera as that tree. The problem is that she is obviously closer to the camera that that tree (she walks in front of it). If 135 feet (estimated) and the tree is 162 feet, she is 5 feet tall. I don't buy that because of the McClaren comparison photo. 135/162 x 72" = 60 inches. It could also be that the JG diagram is not accurate. That tree may be bigger than we think. 14-15" makes this all more realistic. This image is double scale from the original. in 2x scale, the 12 inch tree is 48 px wide, and that's the height of each green rectangle near Patty. You estimated 135 feet and the diagram says 136 feet. That’s pretty close. We have a super short Sasquatch on our hands! Thinker thunkers value of 18 inches for TC1 makes a lot more sense and fits collaborating evidence better than 8 inches does. Which frame has the 5 1/2 inch stump in it? The above statement is a great example of someone 'leading the evidence'....rather than 'following it', Norse. You start with a pre-conception, or notion...(that Patty is 7' tall, or taller)....and then, you choose numbers/"evidence" that fits best with your pre-conception. The fact of the matter is...Thinker's value of 18" doesn't "make more sense".....his number was completely arbitrarily chosen. He pulled it straight out of his Stinker Stunker rear end. The shadow of tree TC-1 is exactly the same width, on Patty's back, as the width of the tree itself. The shadow doesn't taper-down, or narrow, over the course of several feet. You can look-up pictures on-line of tree shadows on snow....and when they are viewed from the right direction, they don't narrow much, at all. It appears narrower than the tree itself, only because it's length appears foreshortened, to the same degree as Patty's back appears foreshortened. But, if Patty were viewed from directly behind....the tree's shadow would appear exactly equal to the tree's actual width. So, if TC-1 is 18" wide....then it's shadow on Patty's back would also be 18" wide. Since it is not covering the full width of her back...and looks like it would require 1.5 to 2 times it's width to cover her back....that would give a 'torso width' for Patty of approx. 27" to 36". Her 'shoulder width' would be even wider, by several inches. I doubt she was that wide. Back to the drawing board. Something is fundamentally wrong. We know Patty's stride, one of the few things measured among many that were estimated. The step length and leg angles in the film don't jibe with the heights being suggested.